Citation Information: J Clin Invest. 2007;117(4):871-873. https://doi.org/10.1172/JCI31860. The paradoxical roles and interplay of IFN-γ in inflammation and autoimmune disease. These roles are best illustrated in the familiar diagram of yin and yang, the “Great Ultimate” [T’ai-chi] diagram. When an inflammatory process (yang) is initiated, IFN-γ is produced to promote inflammation through multiple genes of the immune system (some are indicated). As IFN-γ reaches its peak level (the “hot” point), inflammation intensifies (enlargement of yang area) and compresses its opposite. 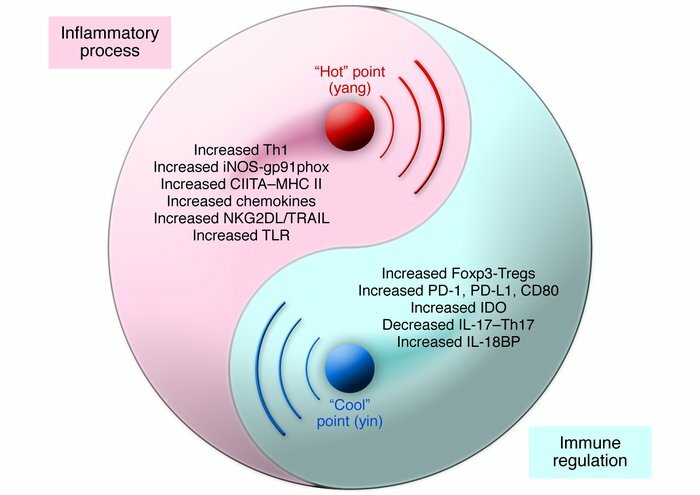 The dominant signal of IFN-γ then flows into the opposite area (yin) and activates a regulatory process through various genes and pathways to reach the “cool” point, resulting in shift of the dividing line toward the reduction of inflammation (enlargement of yin area, mutually compressing its opposite). CIITA, MHC class II–specific transactivator; IL-18BP, IL-18 binding protein; NKG2DL, NK group 2D ligand; TRAIL, TNF-related apoptosis–inducing ligand.